Acer America has just lifted the lid on its new range of Chromebook 13’s, which will all be powered by NVIDIA’s mighty Tegra K1 mobile processor. As the name suggests, the Acer Chromebook 13 will come with a 13.3 inch display, and will be available in either 1080p full HD or 1366×768 display options. NVIDIA’s Tegra K1 SoC features four ARM Cortex A15 CPU cores, accompanied by a companion core for improved battery life, which Acer suggests will last a highly impressive 13 hours. The Tegra K1 also features NVIDIA’s most powerful 192 GPGPU core mobile SoC GPU yet, which is based on its high-end desktop Kepler architecture. Other hardware specifications include a fast solid state hard drive, two USB 3.0 ports, an HD webcam capable of capturing 720p video, stereo speakers, as well as an HDMI port to connect the Chromebook up to an external monitor or TV. In terms of weight, Acer’s Chromebook retains a familiar lightweight look and feel, coming in at just 3.31 pounds and measuring just 0.71 inches thick. Acer will also be offering another version of the Chromebook to commercial and educational customers through resellers, which will come with a 1366×768 display, 4GB of RAM, and 16GB SSD, for a price of $329.99. As well as the US release, Acer’s new Chromebook will go on sale in the UK, Netherlands, Belgium, Denmark, Sweden, Finland, Norway, France, Germany, Russia, Italy, Spain, South Africa and Switzerland. Will you be picking one up? The Acer Chromebook 13 uses the NVIDIA Tegra K1 4-Plus-1TM quad-core ARM Cortex A15 CPU plus a third-generation battery-saver core to provide up to 13 hours of battery life(2). Tegra K1 uses an NVIDIA Kepler architecture-based GPU with 192 programmable GPGPU cores to process rich and detailed graphics. The Acer Chromebook 13’s large 13.3-inch display comes in two models to give customer the options that fit their needs. The version with a full HD 1920×1080 display shows video in lifelike 1080p resolution and provides up to 11 hours of battery life. (2) In addition, models will be available with a bright and crisp 1366×768 resolution display that provides even longer battery life of up to 13 hours. (2) Both displays will have Acer ComfyViewTM anti-glare panels that minimize light reflection that can cause eye fatigue. In addition, the Acer Chromebook 13’s display provides rich colors and excellent contrast, while the large size helps accommodate the spacious keyboard that is both comfortable and maximizes productivity. Designed with mobility in mind, the Acer Chromebook 13 has an incredibly thin and light design that measures only 0.71 inches thin and weighs only 3.31 pounds. In addition, the Acer Chromebook 13 is fanless, so the system is nearly silent while operating. The Acer Chromebook 13 keeps customers in touch and connected with 802.11ac WiFi, which provides speeds up to three times faster than 802.11n. Plus, the 2×2 MIMO antenna helps ensure reliable throughput. by the Chromebook’s HD webcam that provides 720p HD audio/video recording as well as the two built-in stereo speakers and microphone. Gmail, Docs, website bookmarks and other information. Storage on Google Drive(3) protects files, documents, and photos safely in the cloud, and ensures that the most current version of the file or document is always available and safe, even if the Chromebook is lost or stolen. Plus, Acer Chromebook 13 users can view, edit, create and collaborate on-line and off-line with a growing number of programs, such as Office documents and Gmail.  The Acer Chromebook 13 CB5-311-T9B0 has the 1920×1080 full HD display, 2GB of memory and a fast 16GB Solid State Drive(4). It is priced at only $299.99 and is available now for pre-sale at BestBuy.com.  The Acer Chromebook 13 CB5-311-T1UU has a 1920×1080 full HD display, 4GB of memory and a fast 32GB Solid State Drive(4). It is priced at only $379.99 and is available now for pre-sale at Amazon.com. 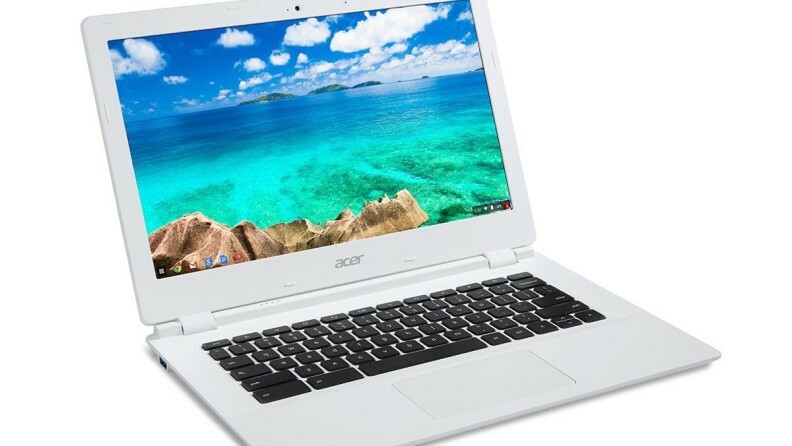  The Acer Chromebook 13 CB5-311-T7NN has a 1366×768 display, 2GB of memory and a fast 16GB Solid State Drive(4). It is priced at only $279.99 and is available now for pre- sale at Amazon.com. Acer is also offering a configuration via resellers that will be sold to commercial and education customers. That model comes with a 1366×768 display, 4GB of memory, a fast 16GB Solid State Drive(4) and will be priced at $329.99. Established in 1976, Acer is a hardware + software + services company dedicated to the research, design, marketing, sale and support of innovative products that enhance people’s lives. Acer’s product offering includes PCs, displays, projectors, servers, tablets and smartphones — tools our customers need to explore beyond limits and experience more. Acer employs 7,400 people and ranks No. 4 for total PCs globally (IDC 2013). Revenues for 2013 reached US$12.02 billion. Please visit www.acer.com for more information.